The recently concluded TechGig Geek Goddess event proved without a doubt that given the opportunity, top coders can appear from any background and are not are not exclusive to the top 10 institutes in India. Ms. Bharti from Maharaja Surajmal Institute, not only topped the Geek Goddess leader board beating hundreds of IIT and NIT graduates, but did it in style by completing all her coding challenges with 2 hours to spare! "This is first time I’ve come first somewhere. At Maharaja Surajmal Institute, I always placed third. I wish I could have called my Dad on stage now that I have come first. Since I was born, I have faced a lot of discrimination being a woman, I never stepped out of my house unchaperoned, even for a day. But when I shared my desire to move to Hyderabad to join Verizon, my dad supported me whole-heartedly, even against the wishes of other family members. He was the one who encouraged me for my education and supported my growth," said a very emotional Bharti. 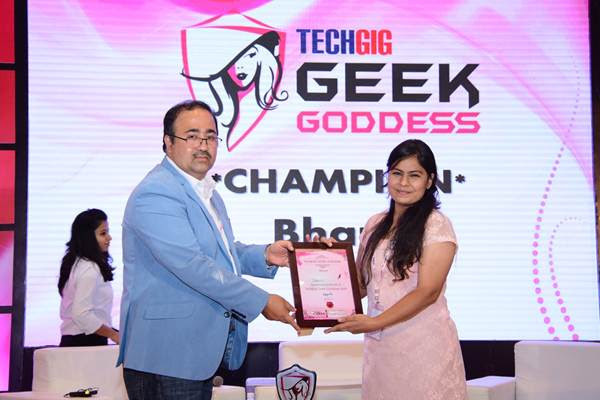 Accepting the TechGig Geek Goddess 2017 title Bharti added, "Everyone says behind every successful man there is a woman, behind me it’s my dad. I dedicate my success and this award to him." Bharti is a B. Tech from Maharaja Surajmal Institute of Technology (MSIT), with proficiency in Java and knowledge of Network and Data Security. Verizon was quick to recognize Bharti’s innate talent and employed her straight out of campus as a software developer at their Hyderabad facilities. “The astonishing victory of MSIT graduate Bharti, at TechGig Geek Goddess substantiates our purpose of democratizing talent. We organize such events to promote true merit and reveal the best coding talent in the country by bringing coders from start-ups and established giants under one roof to compete and unleash their true potential, irrespective of their background. We wish Bharti tremendous success as a role model and inspiration to other women coders,” said Nilanjan Roy, Head of Strategy, Times Business Solutions. Other winners at TechGig Geek Goddess 2017 were, RTMNU graduate Charmy Vora (Rank 2), Sneha Mujumdar from Pune University (Rank 3), Anusha Yakkala from IIT Kgp (Rank 4), and Sonal Bhargava from DAVIET (Rank 5). Upcoming national level competitions and the complete list of winners and finalists are available on the TechGig website.